A major consideration for fume hoods is the material of construction, specifically the liner material. There are many liner types that are used for various applications and the liner must be compatible with the chemicals being used. Selecting the right liner will make all the difference and play a major role in the longevity of your fume hood. Here is a breakdown of the more common fume hood liner types and their qualities. These liners are typically used in non-corrosive environments. If acids were to spill on this material, action must be taken as corrosion will occur. This liner is very economical and is heat-resistant. When considering a steel option, fume hood liners typically come in Type 304 or Type 316 Stainless Steel. These type of liners are designed to provide greater life expectancy in harsh environments. The difference between the two is their makeup. Type 304 stainless steel contains 18% chromium and 8% nickel while Type 316 contains 16% chromium, 10% nickel, and 2% molybdenum. The molybdenum is added to help resist corrosion to chlorides. Type 304 is the most versatile and widely used of the austenitic stainless steels. It is resistant to oxidation, corrosion, and durable. This material is very easy to clean and can come in a variety of finishes and appearances. Type 316 contains 2% molybdenum giving it greater resistance to chemical corrosion than its Type 304 counterpart. It is durable, easy to fabricate, and clean. Being more resistant to sulfuric acid, chlorides, bromides, iodides, and fatty acids, this steel will also cost a bit more. Also known as poly or vinyl, this widely produced synthetic plastic polymer is chemically resistant to acids, salts, bases, fats, and alcohols. Typical applications involve acid digestions with chemicals like perchloric, hydrofluoric, sulfuric, and nitric acids. This material is also commonly found in wash down stations. It has moderate resistance to heat and moderate structural strength. A fiberglass reinforced composite panel liner is the most common fume hood liner. This inexpensive liner material offers high chemical resistance coupled with low smoke and flame toxicity properties. It also provides great temperature control, durability, moisture resistance, and structural strength. The molded fiberglass reinforced polyester offers a sleek, one-piece liner. It is corrosion and fire resistant and makes for easy cleanup. Due to no internal seams, the interior has no cracks where contaminants can collect leading to fewer points of deterioration and longer life expectancy. The high light reflectivity surface is designed to withstand exposure to a wide range of acids, solvents, and alkalis. Just as the purchase of a fume hood is a significant decision, so is knowing its intended use. 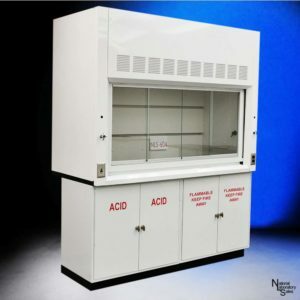 Assess the inventory of chemicals and contaminants that are being used, so the right decision can be made for your fume hood liner. Some liners react when exposed to heat, while others react when exposed to chemicals. Make the proper choice so your fume hood will serve you well for many years. What is the Top Fume Hood Brand? 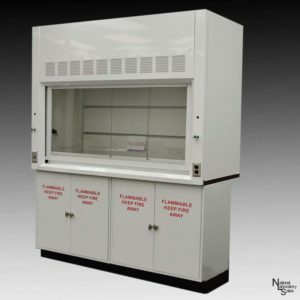 How Much Does a Fume Hood Cost?